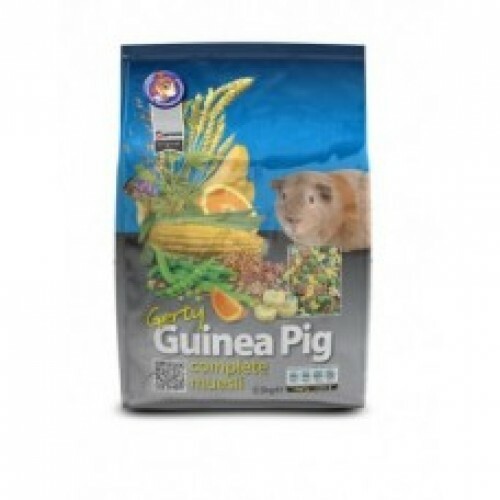 A nutritionally complete food suitable for guinea pigs of all ages – delicious ingredients such as maize, oats, wheat, beans and lucerne make this a balanced diet for guinea pigs that encourages natural foraging behaviour. We add Vitamin C because it is essential for the health of guinea pigs, since (like us humans), they can’t produce their own. Look out for the orange flower biscuits in the Gerty mix to know you’re feeding the right diet with the right amount of Vitamin C. Fresh hay and water should always be freely available, along with a small daily handful of yummy fresh greens – click here for a list of fresh treats that are suitable to feed your pet guinea pigs. Alfalfa meal, flaked peas, flaked maize, wheat, oats, soybean meal, flaked wheat, alfalfa hay, extruded locust beans, ground maize, anise and fenugreek oil, soya oil, dried oranges, dried bananas, calcium carbonate.